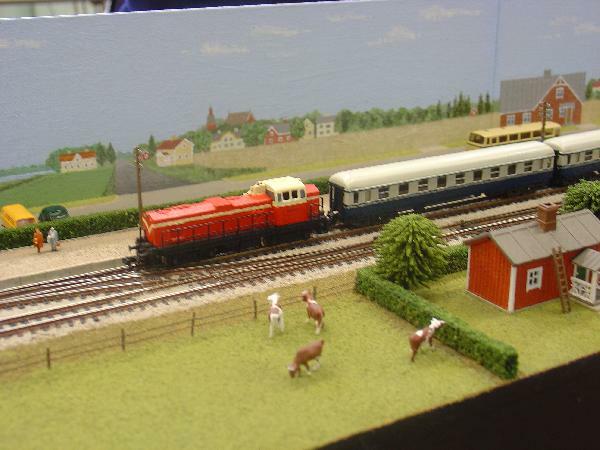 The North Downs Railway Circle show is in the church hall, Church of the Good Shepherd, just up the road from Tadworth railway station, on Saturday 5th September. Puerto Paseo will be among the exhibits. It's tomorrow. Opening times 10am to 5pm. A tad too far to travel (see what I did there? ), piccies are good though. We all like piccies. And then.... how large do you think this OO layout is? The answer is revealed in this shot. It was built on a 600mm long bow-fronted shelf from Homebase, with a fiddle yard adding about another 300mm. What makes it look larger is a rather nice photographic back-scene depicting Ross-on-Wye. Finally, it's official: I have too much rolling stock to fit the storage shelf at Puerto Paseo. Altogether now............"You can never have too much rolling stock!!" That little OO layout is lovely, as is the SR N terminus. The scenery makes the difference in both. I like it when N is used to good advantage, ie trains in the landscape, in that manner. As for the Isla Blanca's stock. Don't we all have too many trains and not enough railway? But it does ensure a good variety over the course of operating the layout. Even if the same two or three locos are regularly seen on the real thing the freight stock in particular would be different for every train. 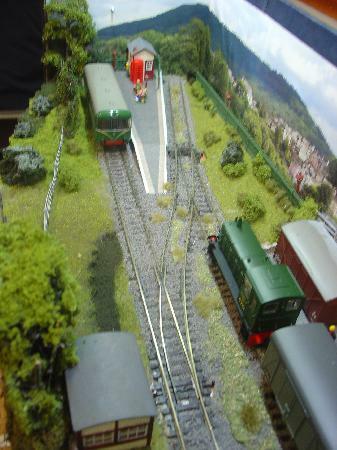 nice to see some SMALL layouts . 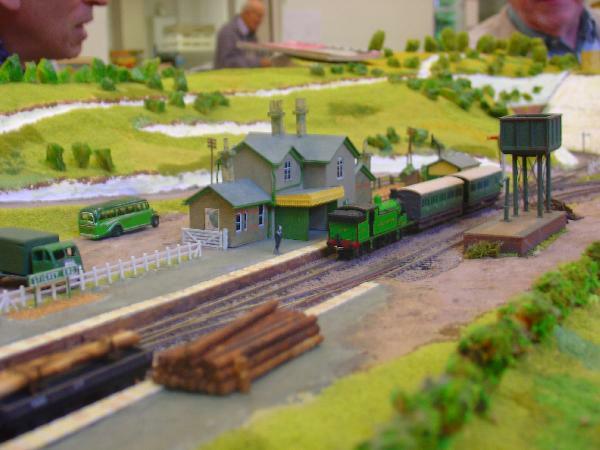 I still wonder why most exhibition managers seem to think big layouts , usually OO or N gauge are what most people want to see. I have noticed there has always been a lot of interest in small different layouts. Obviously not everyone is interested in same type of railways(and trams? ), so why not have general guidelines to have a mixture:- small, large.narrow gauge, tram, UK , American,continental. Many of these 'different' scales and gauges are small layouts. More often than not these small layouts, overall require fewer operators, and don't need large hire vans, so overall costs are a lot less in expenses. When people see they don't actually need much room for a layout, then they have less excuse not to try and build one. I sometimes think, some people like to have that excuse. 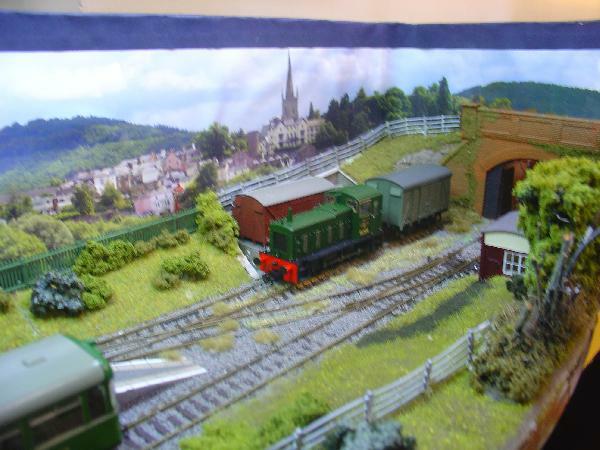 Some very nice layouts there, Giles, thanks for posting the photographs! It seems strange that there aren't many SR layouts in N; ok so there isn't exactly a cornucopia of applicable r-t-r available, but you can do quite a bit with what there is as this layout shows. Sadly I couldn't get there as I was at work, hopefully be able to see some of the layouts elsewhere though. Re: the comment about guidelines etc., the trouble is that in the end, exhibition managers will do whatever they think fit.......as an example of what seemed to me rather odd thinking, my local show last year did not have any advance indication of its content because, according to the exhibition manager, "If people know what's going to be there, they won't bother to come"! That show now has a different exhibition manager and this year, a full list was published in their website, with no noticeable diminution in attendance! Glad you likes them. The SR terminus was nice, but had a rather odd track plan. The line arrived from a tunnel at the rear left of the photo, but the headshunt for running round went off into the right-hand corner of the baseboard, which was curious. Nice, simple but effective scenery, though. The tiny OO one was beautifully done, but I never saw much operating. Most people were more interested in the railbus. On the subject of too much stock. it was nice to be able to operate with longer trains - we were up to about seven items for some services, and (to me) the mixture of coach styles was pleasant. However I did realise that at the end of the day there were a couple of wagons that hadn't been used, partly due to the difficulty of seeing everything on the storage board. There's a piece of ply in the loft measuring about 5x48 inches, so I think an upper stock-storage shelf is called for. Having finally worked out the definitive way of packing the car, I now know there'll be room for it. I did find the level of child control frightening. Going solo, I had to leave the layout in less busy times to fetch coffee from across the hall. Once on my return I found a small boy brandishing two of the wagons he'd picked off the layout. Also the crank for working the turntable proved rather too irresistible to several visitors. If that is repeated I'll have to think of a way to make it child proof, as a polite, but firm request not to touch didn't always work. Trouble is the layout is just the right height to hang onto, while watching the trains. my local show last year did not have any advance indication of its content because, according to the exhibition manager, "If people know what's going to be there, they won't bother to come"! Wow, what a defeatest attitude!! Not surprised you have a new manager! Sounds as if that one thought the Show was going to be rubbish himself!! Edit: I'm sure it wasn't!! 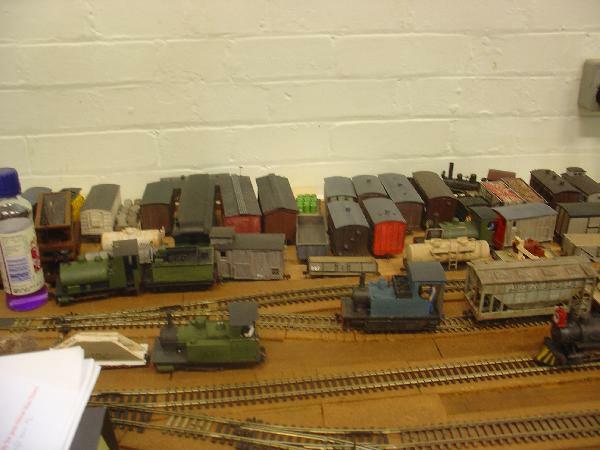 Re 'how much rolling stock', for the few Shows I've done I found I didn't need as much as I took; a lot of viewers don't look for very long anyway, ones that like your layout & come back don't mind seeing some of the same stock again - they may even want to see something again if it appeals to them. Layout height is always a tricky one where you'll never please everyone, & without barriers the kids will always get a teeny bit too close for comfort. I even had an adult, who was deep in conversation in front of my layout, lean against it with outstretched arm. Although I was friendly in tone, I wasn't joking when I said to him that he might not want to lean on my layout too hard. To be fair, he was mortified when he realised what he'd absent-mindedly done, & did apologise. layout height and barriers. That is always a tricky subject. I prefer to put my layouts on tables. that way I don't have to build legs and then transport them. I try to place layout a few inches back from edge so sticky fingers don't accidentally(?) touch anything on layout. This weekends exhibition had barriers which were actually higher than table height, and did not stop small children getting through. I always feel a bit enclosed, and having to duck under to get in and out. One advantage this time as because I did not have much space and talking to the public was difficult, I moved my chair to public side, inside barrier , and this not only meant I could talk easier, but also sort out any train problems easier. 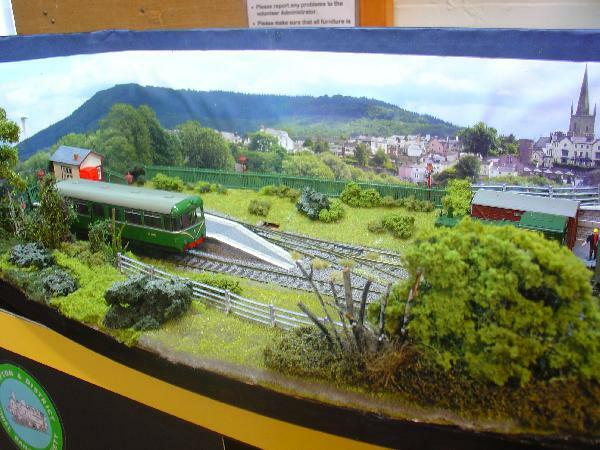 I did on one occasion put clear plastic sheeting on front of a layout, and someone knocked into it and after exhibition I noticed it had been damaged. Gave up on that idea. Maybe some type of small ledge/shelf sticking out at bottom of baseboard top(ie table height), so all those sticky fingers have somewhere to rest.